Image: Brandon Williams/Getty Images. Design: Ashley Britton/SheKnows. January marks the two-year anniversary of the Trump presidency, but it also marks a far more positive occasion. On Jan. 19, the third women’s march will be held in Washington, D.C. and cities all over the country and world. If you’re a parent planning to attend, you’re probably asking yourself: Should I bring my kids to the Women’s March this year? 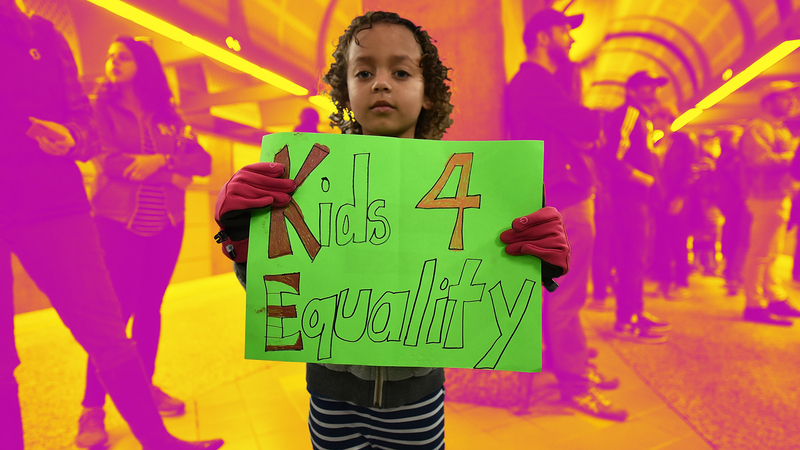 We say: Hell yes, kids belong at the Women’s March. Here are a few important reasons to have your tots by your side as you fight the patriarchy. My mom involved me in her advocacy efforts practically as soon as I could walk — and she continued to do so throughout my childhood and teenage years. As a result, I never thought twice about proudly calling myself a feminist. After all, who doesn’t want equal rights and opportunities? Unsurprisingly, when I reached high school I was on the receiving end of more than a few taunts of “feminazi” and declarations that I must be a lesbian (which, of course, isn’t an insult — but it’s not the same thing as being a feminist). The reason was pretty straightforward: Many people, including adults, associate feminism with hating men and “playing victim” when we dare call out the fact that we live in a patriarchal society. But feminism means a lot more than that. Sure, when I was young, I didn’t understand the intricacies of policy and the incredible importance of intersectional feminism. But because I was raised to fight for women’s rights, I began to consciously educate myself as I got older — and as a white woman who is constantly working to make her feminism more intersectional, it’s something I continue to do to this day. I’m forever grateful I was introduced to feminism at an early age. Attending the Women’s March with your kids is the perfect opportunity to start conversations about feminism, why it’s so important and what’s at stake for women in 2019. Prior to attending the march, talk to your kids about why you’re going and why you’ve decided to take them. For young kids, put things in simple terms, such as, “We deserve control over what happens to our bodies.” If you’re taking older kids or teens, expand that comment to explain that access to birth control and safe, legal abortion is currently at risk. Post-march, ask your kids what they thought of the experience and what they liked and didn’t like about it. Which signs did they love, and what about the messages resonated with them? Were there certain signs that confused them? If so, you have the perfect opportunity to explain what the sign-holders meant. Although the Women’s March was, of course, the result of women fighting back after 63 million Americans helped elect a misogynist, its guiding principles affect many Americans. These issues include racial justice, common-sense gun legislation, police brutality, LGBTQ rights and the racial and gender inequities in the criminal justice system. Many signs and speeches at the Women’s March will address these multifaceted issues, and this opens the door to conversations with your kids about many important social and political issues. When you introduce your children to activism, you want it to be a positive experience for them — otherwise, they may head for the hills the next time you suggest attending a social-justice event of any kind. Here are some tips to make the process as smooth and successful as possible. Pack snacks and water. It can be a long day, and restaurants along the route are often packed. Make sure you’re dressed for the weather. In some cities, this may mean layers upon layers, while in warmer (and sunnier) parts of the country, sunscreen will be a must. And make sure everyone wears comfortable shoes, because nothing puts a damper on the Women’s March quite like making the whole “marching” part excruciating. Protesters have been present for the past two years, and there’s no reason to think 2019 will be any different. Explain to your kids that you may encounter people who disagree with you and advise them to ignore those people and not to yell back at any aggressive protesters.